Mixture and Alligation Exercise - Maths Questions Answers with Sol. Gold is 19 times as heavy as water and copper is 9 times heavy. In what ratio must these metals be mixed so that the mixture may be 15 times as heavy as water? In a mixture of 45 litres, the ratio of milk and water is 3 : 2. How much water must be added to make the ratio 9 : 11? Let x litres of water be added to make the ratio 9 : 11. In a mixture of 45 litres, the ratio of milk and water is 4 : 1. How much water must be added to make the mixture ratio 3 : 2? A mixture (40 litres) contains tonic and water in the ratio 3 : 1. To make the ratio 7 : 2, how much additional amount of water is required? ⇒ x = 2 litres. In three vessels, the ratio of water and milk is 6 : 7, 5 : 9 and 8 : 7, respectively. If the mixtures of the three vessels are mixed together, then what will be the ratio of water and milk? Increase value of total to 2730 as follows. Alternate method is dividing options by 13, 14 & 15. A jar of oil was four fifths full. When six bottles of oil were taken out and four bottles of oil were poured into, it was three fourths full. How many bottles of oil were contained by the jar? Let the capacity of the jar be of x bottles. A cane contains a mixture of two liquids A and B in the ratio 7 : 5. When 9 litres of mixture are drawn off and the cane is filled with B, the ratio of A and B becomes 7 : 9. How many litres of liquid A was contained by the cane initially? Suppose the cane initially contains 7x and 5x litres of mixtures A and B respectively. So, the cane contained 21 litres of A. A vessel is fully filled with a special liquid. Four litres of liquid is drawn out of this vessel and is replaced with water. If the ratio of the special liquid to the water becomes 1: 2, then what is the capacity the vessel? Let capacity of the vessel be x litres. Two equal glasses filled with mixtures of alcohol and water in the proportions of 2 : 1 and 1 : 1 respectively were emptied into third glass. What is the proportion of alcohol and water in the third glass? A mixture of Nitric acid and Sulfuric acid is taken in the ratio of 1 : 2 and another mixture of the same is taken in the ratio 2 : 3. How many parts of the two mixtures must be taken to attain a new mixture consisting of Nitric acid and Sulfuric acid in the ratio of 3 : 5? Several litres of acid were drawn off from a 54 litre vessel, full of acid and equal amount of water was added. Again the same volume of the mixture was drawn off and replaced by water. As a result now, the vessel contained 24 litres of pure acid. How much of the acid was drawn off initially? Two vessels contain mixtures of milk and water in the ratio of 8 : 1 and 1 : 5 respectively. The contents of both of these are mixed in a specific ratio into a third vessel. How much mixture must be drawn from the second vessel to fill the third vessel (capacity 26 gallons) completely in order that the resulting mixture may be half milk and half water? Let x gallons of first mixture be mixed with y gallons of second mixture. A container contains 40 litres of milk. From this container, 4 litres of milk was taken out and replaced by water. This process was repeated further two times. How much milk is now contained by the container? Three containers A, B and C are having mixtures of milk and water in the ratio 1 : 5, 3 : 5 and 5 : 7, respectively. If the capacities of the containers are in the ratio 5 : 4 : 5, then find the ratio of the milk to the water if the mixtures of all the three containers are mixed together. Let the third type of tea is priced at Rs x per kg. Also suppose that the three types of tea mixed together are ℓ, ℓ and 2 kg,respectively. 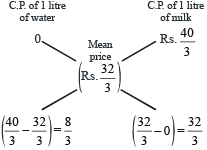 How much water must be added to 60 litres of milk at 1½ litres for Rs 20 so as to have a mixture worth Rs 10⅔ a litre? = 8 : 32 = 1 : 4. Pure milk costs Rs 3.60 per litre. A milkman adds water to 25 litres of pure milk and sells the mixture at Rs 3 per litre. How many litres of water does he add? Since in every 5 litres of milk, he adds 1 litre of water. ∴ In every 25 litres of milk, he adds 5 litres of water. Sameer bought 10 kg of tea at Rs 45 per kg and 8 kg at Rs 50 per kg. He mixed both the brands and sold it at a total profit of Rs 32. What was the selling price per kg of the mixture? A mixture consists of 15 parts of coffee, purchased at Rs 2.10 per kg and 1 part of chicory, purchased at 98 paise per kg. If it is sold at Rs 2.25 per kg, what profit would be made on the sale of 5 quintals?